Today NASA and General Motors revealed their plans to build a new humanoid robot known as Robonaut2 – or R2 -- capable of using the same tools as humans letting them work closely with people. According to the companies they have combined advanced control, sensor and vision technologies to build robots capable of helping astronauts during hazardous space missions or GM build safer cars and factories. Toyota and Honda have also built advanced human-like robots. Robonaut 2, or R2, is a faster, more dexterous and more technologically advanced robot than past bots. R2 can use its hands to do work beyond the scope of prior humanoid machines and can easily work safely alongside people, a necessity both on Earth and in space, NASA stated. It is also stronger: able to lift, not just hold, a 20-pound weight (about four times heavier than what other dexterous robots can handle) both near and away from its body, NASA stated. R2s are the second generation of NASA/GM robots. 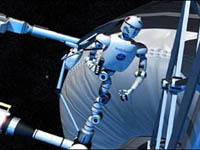 The original Robonaut, a humanoid robot designed for space travel, was built by the software, robotics and simulation division at Johnson in a collaborative effort with the Defense Advanced Research Project Agency 10 years ago, NASA stated. The R2 and other robotics like it will be one of the future technologies NASA invests heavily in. In its 2011 budget, NASA asked for $3.0 billion over five years to develop a steady stream of robots for exploration to scout locations and demonstrate technologies that increase the safety and capability of future missions, NASA stated. NetWorkWorld has contributed to the report.